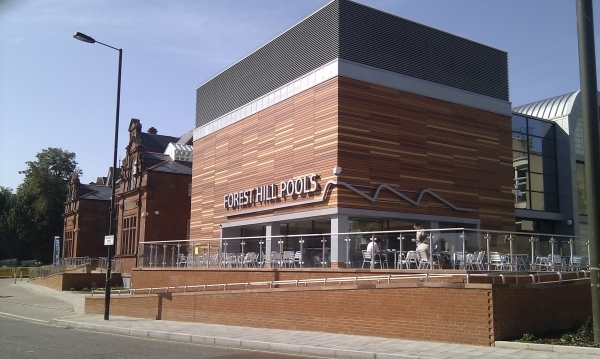 One of the best things to have happened to Forest Hill in recent years was the opening of the London Overground line in May 2010. This has provided more travel options, opened up new places north of the river and attracted more passengers. 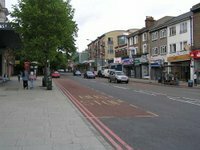 The London Overground and National Rail go through the two stations in SE23 – Forest Hill and Honor Oak Park. Forest Hill Station, which opened in 1839, was originally known until 1845 as Dartmouth Arms after the nearby public house which still exists (though not in the original building) a few doors up from the station at 7 Dartmouth Road. But there used to be two other railway stations in Forest Hill – Lordship Lane and Honor Oak stations. They were both on the now closed Crystal Palace High Level Line. Steve Grindlay’s article on this Line in the Summer 2014 (Issue 28) of the Forest Hill Society Newsletter gives information on the Line and the stations. Suffice to say here that the two lost stations were both built in the 1860s during the heyday of railway expansion, partly to carry visitors to the Crystal Place - which had been relocated from Hyde Park to Sydenham in 1854. The two stations were both closed on 20 September 1954, several years before the Beeching cuts of the 1960s. It seems that the High Level Line was never quite as successful as hoped. The destruction of the Crystal Palace in the fire of 1936 and the damage and disruption caused by the Second World War were blows which sealed the eventual demise of the Line and the stations. With Steve’s article in my rucksack, I set off to locate the two stations. The former Lordship Lane station was located just to the west of Sydenham Hill, and south of London Road, where Sydenham Hill meets London Road. This is the point where London Road becomes Lordship Lane at the junction with Wood Vale, virtually opposite the blue sign that says Welcome to Lewisham. The streets which now occupy the former station are Lapse Wood Walk and North Crofts, Sydenham Hill which both have SE23 post codes but are in the Borough of Southwark, not Lewisham. In his article Steve states that nothing, apart from sections of the embankment, now survives. This is true and if you did not know a station had been there I doubt you would know that the embankment was once part of a railway station and line. The Green Chain Walk now rather incongruously weaves through the houses and apartment blocks here. Lordship Lane is the station which was famously painted by Camille Pissarro in 1871 from his viewpoint on the railway bridge which still exists in nearby Sydenham Hill Woods (see above). 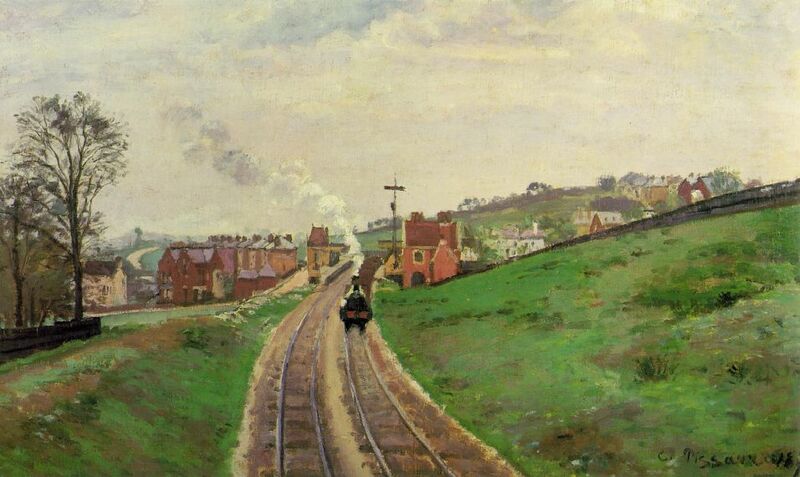 The painting is commonly known as “Lordship Lane Station, Dulwich” and I have also been to an exhibition where it was described (presumably mistakenly) as “Lordship Lane Station, Upper Norwood” (which is where Pissarro lived). These possibly reflect that in 1871 Forest Hill was not yet a widely recognised district of London. 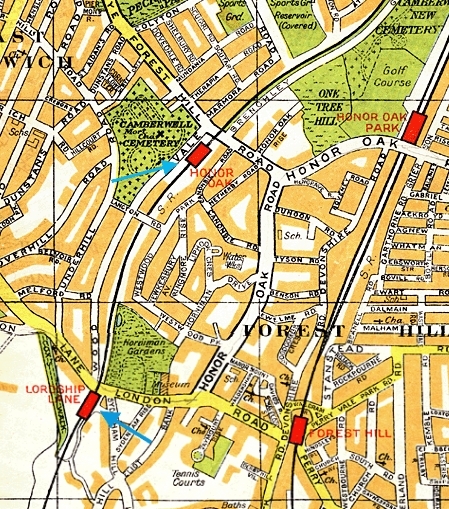 Wood Vale would once have been one of the best served roads in London for railway stations. With Lordship Lane station at its southern end, it also had Honor Oak station at its northern end. Honor Oak station was the next station from Lordship Lane on the Crystal Palace High Level Line going towards London. 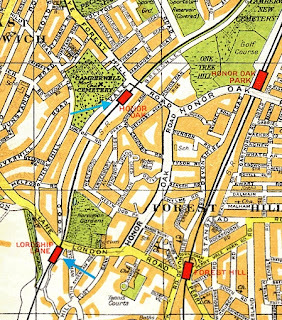 The line went over London Road on a bridge and Honor Oak station was located just to the east of Wood Vale and between it and the flat part of Canonbie Road where they meet Forest Hill Road, opposite Brenchley Gardens. No trace of the station remains, although as with Lordship Lane station, there are some traces to be seen (with a little imagination perhaps) of the railway embankment in Buckley Close and the Wood Vale Estate. Apparently, the old station master’s house remains nearby on Canonbie Road. So nothing much remains to be seen of the two lost railway stations on the western edge of Forest Hill but it was interesting to explore and see, as far as possible, exactly where they were and what they are now. Steve is a fantastic fountain of knowledge. What would we do without him. The former Friends of The Great North Wood produced a leaflet covering the former railway line Nunhead to the Screaming Alice which has about the history of the railway and what wildlife you might see along the 5 mile route. The leaflet is available from the London Wildlife Trust Information stall at Sydenham Hill Wood (near the old railway tunnel) most Sundays for £1 or if you can e-mail the Sydenham Hill Wood Project Manager at dgreenwood@wildlondon.org.uk for more information. What a weird winter – weather-wise!